Your business is in the spotlight with the completely customizable private label, which will establish you as the ticketing provider - with your branded look on the system, event pages, tickets and more. 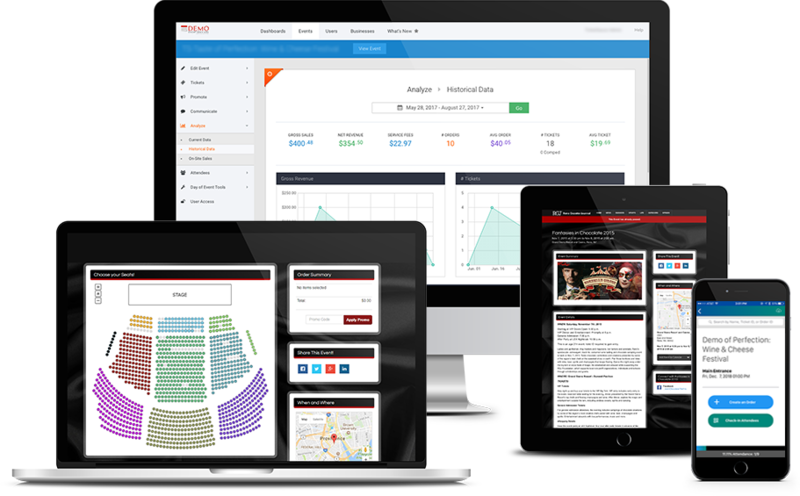 You can even resell the system to become a ticketing leader, and manage events under your brand with custom user access, ability to modify branding, and robust reseller guidance to help you generate a new stream of revenue. Easily create beautiful events that automatically optimize for every device - making online purchasing both engaging and easy. Have a complicated event? No problem! TicketSauce allows you to create ticket types that work for you including sub ticket types, linked ticket types, multi-tickets, activities within an event, registrations and more. From promo codes, to rich social features, to communicating with customers through Email and SMS, we know how to get the word out to your current and future customers. Easily access all your data and information, and gather actionable insights for your events. All data is tracked and reported, and owned and accessible to you. Create custom questionnaires and set what information you want to collect per purchase or ticket. And, best of all, YOU own and have access to this data 100%. The API data feed allows your developers to completely integrate with the system. Pull ticket and customer data into your organization’s CRM. Automatically post event listings to your website, and implement a dedicated event search engine. Easily turn your mobile devices into a robust box office system with effortless POS and at the gate sales capabilities, including search by customer name or order. Make every guest feel like a VIP with our easy to use name badges and other day of event guest identifiers. Do you need another login and password in your life? Neither do we! That’s why the event check-out is designed to be super simple, intuitive and uncomplicated - with customers not required to create a login to purchase. The TicketSauce system hosts and has perfected tools for working with events and partners from around the globe. Create unlimited admin logins, all with customized access to whatever sections and events you need them to be able to utilize. Easily add day of event support logins to be able to access the mobile box office to sell and check-in tickets.